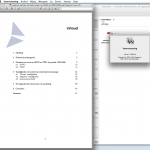 PDF has won. 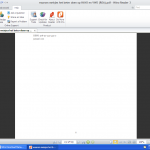 It is the file format to send documents to others and to archive them for the future. However, not all PDF readers are created equal. Most of us use Adobe Reader, but many people who use a Mac or Linux will use other programs. 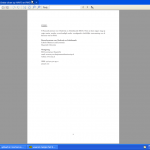 Also, some Windows users have installed faster PDF readers such as Sumatra. Most tech-savvy users have a speedy PDF reader already installed. But does your reader support the full PDF feature set? One such feature is Page Labels. For example, many books have the first few pages numbered using Roman numbers, while the main body of the book is numbered using Hindu-Arabic numbers, often starting again with number 1. Page Labels were added since PDF version 1.3, and can be found in the 1.7 specification under “12.4.2 Page Labels”. 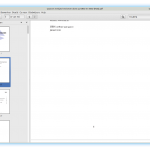 Each page in a PDF document shall be identified by an integer page index that expresses the page’s relative position within the document. 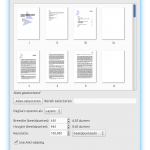 In addition, a document may optionally define page labels (PDF 1.3) to identify each page visually on the screen or in print. 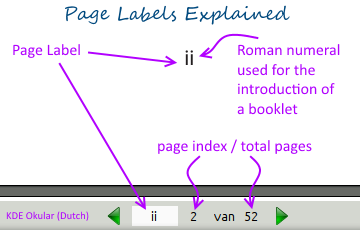 Page labels and page indices need not coincide: the indices shall be fixed, running consecutively through the document starting from 0 for the first page, but the labels may be specified in any way that is appropriate for the particular document. Earlier, in 2011, I ran a few tests and posted the results on TechMonks. At that time, Okular (KDE) did not support Page Labels, for which I filed a bug, which has been resolved. I have repeated the test (2014-11-25) and now, after some delay due to personal circumstances, the new results are posted below. Note: Some screenshots are from Duch language versions. 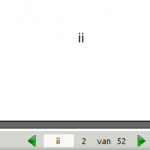 The PDF document used for testing was waarom meisjes het beter doen op HAVO en VWO (ROA).pdf.